Powerful 925 Watts motor for high extracting rate. Double Ball bearing motor ensures frictionless movement and longer life. 3+1 speed for soft and hard fruits and vegetables. Professional Powerful motor for all day Juicing, quality blending & grinding. 1.5 Liters Polycarbonate Jar for Blending. Stainless Steel Jar for grinding. Juice O Matic Plus JMG SM Series is a complete power machine as it does its Juicing, Grinding and Blending jobs more efficiently than any other machine in the market. 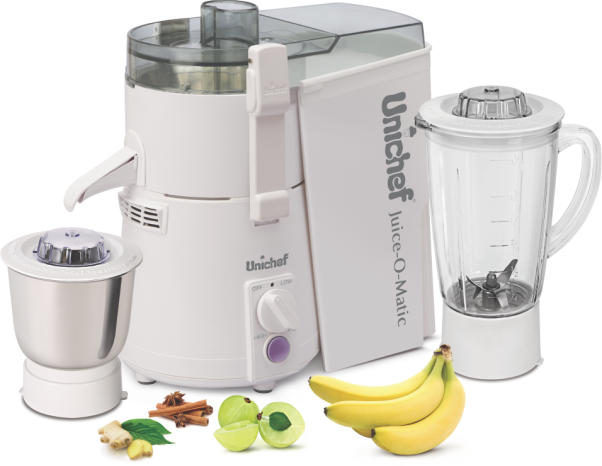 As a Juicer the Juice O Matic Plus is known for high efficient extracting as its 925 Watts motor with micro fine mesh and critically balanced stainless steel blades ensure an extraction rate of as high as 65%. It is a heavy duty product manufactured using the highest quality materials and engineered for all day juicing. As a Mixer the Juice O Matic Plus is useful for all day grinding as it comes along with a grinder for tough Dry and Wet Grinding. The Stainless Steel Grinder comes along with a heavy aluminum base thus providing stability and heat resistance during tough operations. As a Blender the Juice O Matic Plus is as useful as our specially designed Fruit Mixer as it comes along with a 1.5 Liters polycarbonate plastic base jar. The utility of this product can be better judged by the performance it delivers during all day blending as it does its job in the most fastest and in the easiest manner. Juice O Matic Plus SM Series comes in an elegant appearance and a compact counter top designed for power, durability and unlike other power machines is easy to use & store. Found in restaurants and juice bars in India, it has it has proven to be the best power juicer in the market with 925 Watts powerful motor for all day juicing solutions. Serious juicing consumers would not need adequate counter space in their home kitchens in order to enjoy Healthy Juicing quality Blending and Grinding as well. The Juice O Matic Plus SM Series is ideal for Juice Bars, Restaurants, Spas, Health Clubs, Institutions Hotel/Catering Kitchens – and obviously a place where it should be, Home Kitchens for a Healthy Juicing Power, Smooth Blending and Tough Grinding thus making it a complete premium kitchen machine.